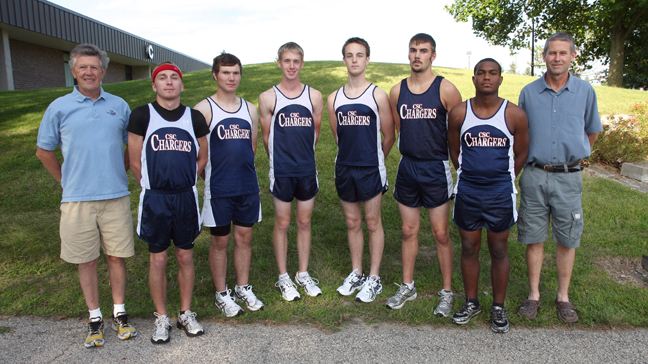 Left to Right: Assistant Coach Jim Graham, Wes Anderson, Joe Shepherd, Justin Calhoun, Michael Sagona, Richmon Bloomgren, Travis Anderson & Head Coach Bruce Tracy. Joe Shepherd Soph. ROWVA, Ill.
Justin Calhoun Fresh. Canton, Ill.
Travis Anderson Fresh. Rock Island, Ill.
Wes Anderson Fresh. Galesburg, Ill.
Michael Sagona Fresh. Knoxville, Ill.
Richmon Bloomgren Fresh. Galesburg, Ill.